These words, by historian Stephen Ambrose, are inscribed on a bronze statue of explorers Meriwether Lewis and William Clark near the spot where the two men met in the fall of 1803. The statue is not in St. Louis, Mo., long celebrated as the launching pad for the famed journey, but at the Falls of the Ohio State Park in Clarksville, Ind., near the cabin of Clark’s brother, where the explorer was staying. For the members of the Indiana Lewis and Clark Expedition Commission, the statue is just one part of an ongoing effort to rewrite the narrative of the expedition to better reflect historical fact and to promote the important role played by the Kentuckiana region in that seminal event of American history. The Commission renewed its commitment to that mission at its quarterly meeting last month, held on the campus of IU Southeast. The Commission is composed of regional and civic leaders, including state legislators such as Indiana Senators Ron Grooms and Mark Stoops, Representatives Matt Pierre and Thomas Saunders, and 2016 Chancellors Medallion recipient Rep. Ed Clere. This was the first time the Commission had met at IU Southeast, though its links to the campus date to its inception. For those who need a refresher: at the behest of President Thomas Jefferson, Lewis and Clark led their Corps of Discovery to the Pacific Ocean through territory acquired from France (the Louisiana Purchase), documenting native culture, flora, fauna, geology and more along the way. They returned in 1806. “We need to establish this as the starting point for the expedition,” Keith said. 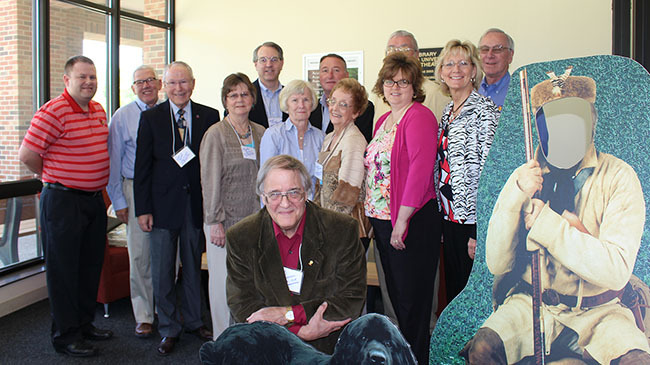 Members of the Lewis and Clark Expedition Commission take a break from their quarterly meeting at IU Southeast, alongside some of the displays they have funded to help tell the story of the expedition. It has worked to win inclusion of the region in an eastward extension of the Lewis and Clark National Historic Trail, now being considered by the National Park Service after a decade-long review. In addition, the Commission is lobbying the governor of Indiana to name the new east end bridge after the explorers. “Having a Lewis and Clark Bridge over the Ohio River between Indiana and Kentucky highlights a national discussion about Indiana and Kentucky’s history,” said Phyllis Yeager, a founding member of the Commission and a leading figure in the Lewis and Clark Trail Heritage Foundation. Yeager believes there are many benefits to recognizing Kentuckiana as the place “where it all began,” among them being a boost to tourism and regional pride. Over one third of expedition participants had roots in the region, she explained, and Clark was the brother of George Rogers Clark, founder of Louisville. It was Yeager who spearheaded the statue project at the Falls of the Ohio State Park. IU Southeast has been uniquely positioned to collaborate with the influential Commission. Dr. Claudia Crump, director of the Center for Cultural Resources (CCR) and Dr. Carl Kramer, retired adjunct faculty in history, are longtime Commission members. Their contributions over the past decade have been instrumental in the Commission’s success and have served the broader interests of education within the region. In 2003, the CCR created the Lewis and Clark Center, lending free resources to area schools and youth organizations. At that time, the Commission funded the creation of historical markers, among which was a series of life-size character cutouts created by former IU Southeast graphic design faculty Prof. Marilyn Whitesell for display at the Falls of the Ohio State Park, before returning to CCR where there are lent to teachers. The Commission has also funded teacher training institutes, bringing nationally renowned scholars to speak at IU Southeast, including historians and Lewis and Clark experts Dr. Gary Moulton and Dr. Jay Buckley. Last year, the Commission donated scholarships that enabled 12 youth leaders and guardians to attend the CCR/IU Southeast Bicentennial Institute with educators from across the state. Over the years, IU Southeast has proven itself an effective vehicle for the transformation of Commission proposals and recommendations into actual practice. “The Center has inherited major responsibilities for keeping Lewis and Clark on school agendas, and for correcting misconceptions that the expedition started in St. Louis,” said Crump. This year, the Lewis and Clark consciousness raising effort came full circle. The Commission meeting was scheduled to coincide with the second Social Studies Day organized by Crump and Neil Brewer, senior lecturer in education with a concentration in social studies. 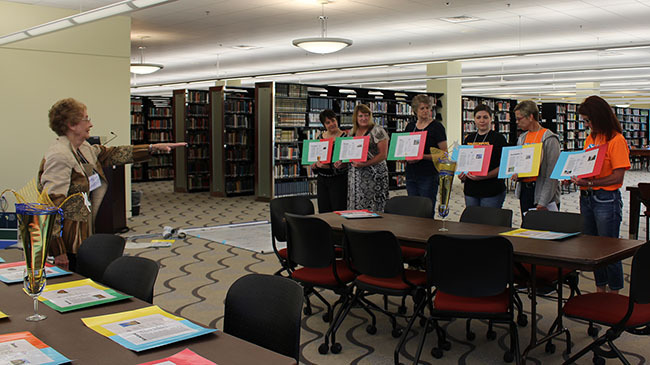 The day-long workshop gave teachers from the region some innovative and fun ways to present social studies content – especially relating to Lewis and Clark and the Indiana bicentennial — to their students, using the resources available at the CCR. The Commission assumed the cost of substitute teachers so this particular group of teachers could take part in Social Studies Day. Dr. Claudia Crump (l) of the Center for Cultural Resources builds a timeline with teachers from the region during Social Studies Day. While the Commissioners discussed the bridge naming and National Park Service designation, the teachers learned how to create human timelines and saw demonstrations of the latest GPS-based maps. The two groups came together over lunch – a Lewis and Clark themed meal prepared by IU Southeast executive chef Aaron Wilder and inspired by the explorers’ expedition cookbook. The Commission gained feedback that could be a great source of satisfaction at the reach of its efforts so far. At the same time, the Commissioners heard about day-to-day challenges in today’s classrooms, such as struggles with implementing state standards in a class of wildly varying abilities, issues that can affect the ability to convey complex social studies curricula. “For the teachers, this was an opportunity to feel they had a voice in making recommendations for strengthening social studies in the future through the Lewis and Clark commissioners, among whom are state leaders,” said Crump. In this Indiana bicentennial year, the event illustrated the commitment of IU Southeast to playing an active role in both the preservation of the state’s historical legacy and the creation of its future. “IU Southeast is and continues to be a national leader in teaching social studies educators,” Yeager said. The Commission is now planning a large Lewis and Clark Bicentennial Festival for the fall (Sept. 29-October 2) at the cabin of George Rogers Clark, the spot where the two explorers first shook hands. According to Keith, there will be reenactors, a keel boat, teaching stations and a puppet show with 10-foot puppets supported by the Jeffersonville Arts Alliance. Among those attending, it’s fair to expect that there will be middle schoolers inspired by teachers who took part in Social Studies Day.